A Triune God-There Is None Other – I Am Not Ashamed Of The Gospel Of Christ! Then he said, “When I was with you before, I told you that everything written about me in the law of Moses and the prophets and in the Psalms must be fulfilled.” 45 Then he opened their minds to understand the Scriptures. 46 And he said, “Yes, it was written long ago that the Messiah would suffer and die and rise from the dead on the third day. 47 It was also written that this message would be proclaimed in the authority of his name to all the nations, beginning in Jerusalem: ‘There is forgiveness of sins for all who repent.’ 48 You are witnesses of all these things. Pentecost falls on June 4th this year, marking the time the Holy Spirit descending like a fire upon the disciples anointing them with the promise of a counselor to guide them. Through Pentecost we see the true meaning in the book of acts of how a mighty rushing wind passed over the people and they were filled with the holy spirit,suddenly those who were of every nation and language could hear every man in their own tongue! (Acts 2:1-8). The brick and mortar churches many attend once a week for an hour is a far cry from the one true church Jesus taught His disciples that would be purchased by His shed blood!A church that would be built in three days.Simon Bar-jo’-na was the first to have this revealed to him from God the Father that he was the rock on which Jesus would build His church. (Matthew 16:15-19). All of this is proof and celebration of a Risen Lord. The last, and the fulfillment of prophecy concerning the Messiah. Jesus fulfilled every prophecy about the Messiah, yet Christians today want to honor another God so badly they twist even this. We can’t write about this enough as God will not allow us to rest while so many are falling behind a beast. Imagine what John experienced as he was given the visions from the end times. He knew that Christ’s church would grow, he knew that we would be persecuted, he knew we would be beheaded, he knew there was a terrible beast that would unite all foreign God’s and evil demonic doctrines, he knew God’s judgement would be exacted on an unbelieving world and that many would not repent, but actually run to the beast. Jesus knew that there would be those who Blaspheme the Holy Spirit. That’s why He showed Paul and even Peter how to come against this. He gave Paul the Armor of God, He told Peter that Satan had asked to sift His Soul but he would return. Jesus didn’t leave us as orphans. Through Him power was sent from the Father in the Holy Spirit. Jesus didn’t leave us with the promise of another prophet, and he even warned that Blasphemy of the Holy Spirit would not be forgiven in this life or the next. There is so much written in the Old and New Testament and the Torah about the Holy Spirit or the Shekinah. It starts in Genesis, breathing life into Adam. The word of God came to the Prophets through the Holy Spirit. Hence all creatures live only through the spirit given by God. In a more restricted sense, however, the spirit of God is not identical with this life-giving spirit. He pours out His own spirit upon all whom He has chosen to execute His will and behests, and this spirit imbues them with higher reason and powers, making them capable of heroic speech and action. Again so much is written about the Holy Spirit there’s not enough room in this post. Jesus fortold this Spirit would come after him to guide His church into truth just as God’s spirit was poured out on His chosen people Israel. Through Jesus we received this counselor as Jesus said. Again we find so much heresy in the mixing of Christianity and Islam it’s deafening. There is no common ground here. None. Evangelicals and the Pope are changing doctrine to fit into a mixing of faiths. The Pope is heading to Egypt to mend ties and show respect to muslums. He is apologizing for Pope Benedict’s criticism of the persecution of Christians by Muslims in Egypt. Leaving Christians again vulnerable . 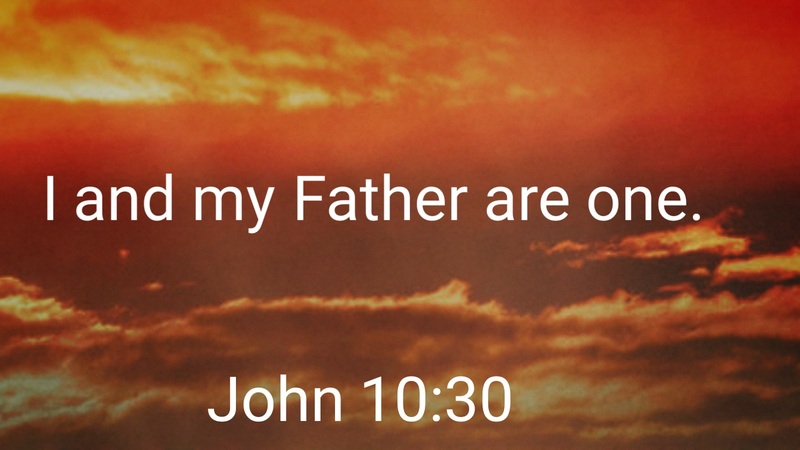 Jesus is the Alpha and the Omega period. We will end this here, with God’s warning about changing scripture. GLORY AND PRAISE TO THE FATHER, THE SON AND THE HOLY SPIRIT! As Julia writes in “God Of The Daily Church”, Through the Holy Spirit God adds to his church DAILY those who through repentance are being saved and we find this truth in the book of Acts. “Then Peter said unto them, Repent, and be baptized every one of you in the name of Jesus Christ for the remission of sins, and ye shall receive the gift of the Holy Ghost. It’s Called Bait And Switch!